Known for his work in the movie series, “American Pie”, Eugene Levy was born on December 17, 1946 in Hamilton, Ontario. After graduating from Westdale Secondary School, he enrolled McMaster University, where he became the vice-president of the university film group. During his time there, he met many people whom he would later work with including; Dave Thomas, Ivan Reitman and Martin Short. Levy started his career in 1970 with Reitman’s film, “Cannibal Girls”, whose released was delayed till 1973. He also became the part of the comedy sketch series, “Second City Television”, in which he played characters like Bobby Bittman and Stan Shmenge. He also became famous for his impersonations some of which included; Sean Connery, Henry Kissinger, Muammar al-Gaddafi and Jack Carter amongst many others. 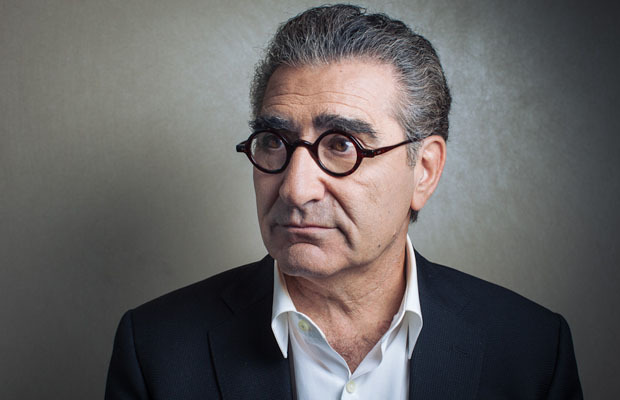 Aside from his work for “Second City Television” which was extremely popular and widely appreciated, Eugene Levy also started appearing in movies like “Running” in 1979 and also did a voiceover in the animated movie, “Heavy Metal” in 1981. After “Second City Television” ended, many of Levy’s co-actors moved to America to pursue their acting careers, but he chose to stay behind. He expressed the wish to continue working in Canada so that he and his wife, Deborah, could raise their two children. Even though Levy has appeared in multiple Hollywood movies, his roles have been either minor or supporting. In 1983, he accepted to play the role of a car salesman’s in the movie, “National Lampoon’s Vacation” and in 1984; he appeared in the movie, “Splash” in which he played a scientist who desires to capture a mermaid. Following in 1986, he appeared in the movie, “Club Paradise” which had many of his “Second City Television” co-actors, as “Barry” who manages a failing resort. One of his larger roles came in 1986, when he was offered to play a security guard in the movie, “Armed and Dangerous”, starring opposite to Candy. Eugene Levy’s work was not just restricted to acting as he has also tried his hand at production, direction and writing. He was behind a lot of characters played in “Second City Television” and in 1984, he co-wrote and was the executive producer of, “The Last Polka”. Following this, he also directed, wrote and worked as an executive producer for “Autobiographies: The Enigma of Bobby Bittman”. In 1988, along with acting, he also produced and directed, “Second City’s 15th Anniversary Special”. Most of Levy’s work in early 1990s was behind the scenes; in 1990 he created the series, “Maniac Mansion” while also performing as an executive producer and writing and directing some episodes. In 1992, he directed the movie, “Partners ‘n Love” as well as “Once Upon a Crime” which was his first feature film. Sadly, the film failed to impress the critics and did not fare well at the box office either. He continued working in supporting roles for movies like, “I Love Trouble” in 1994 and “Father of the Bride Part II” in 1995, amongst others. In late 1990s Levy’s career took off after he collaborated with Christopher Guest and acted in and wrote the script for “Waiting for Guffman” as Dr. Allen Pearl. The movie was a huge success and soon Levy was appearing in more Hollywood movies. His next big projects were the American Pie series where he plays the father of the lead character. He has also earned many awards including a Grammy as well as Satellite Award in 2004.